2 Combine all ingredients except crescent rolls in large bowl. Separate each package crescent rolls into 4 squares; press diagonal perforations to seal. Spoon turkey filling onto center of each square. Fold dough diagonally over filling to form triangles; press edges firmly to seal. 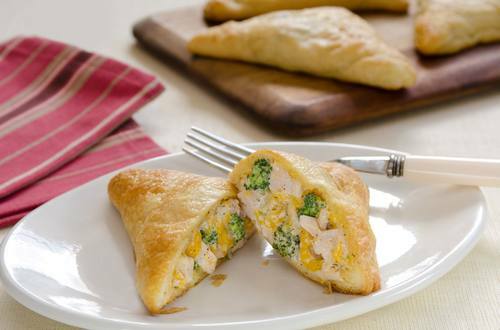 Arrange turnovers on baking sheet; brush tops lightly with additional Hellmann's® or Best Foods® Real Mayonnaise. 3 Bake 12 minutes or until golden. Serve warm.